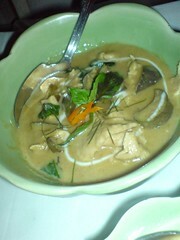 I am perennially frustrated looking for Thai food in Metro Manila. At the apex of the Thai food pyramid is Benjarong at the Dusit Hotel, but you have to be a druglord/gambling lord/member of the cabinet/Meralco director to be able to afford eating there on more than a semi-annual basis. That not being the case, what’s one to do? Our memories are littered with the empty shells of once-popular Thai restaurants that have disappeared. The world’s just waiting for someone to write a book explaining how Thai food is really, the perfect health food because there don’t seem to be many obese or even pot-bellied people in Thailand, and yet they eat out a lot. I’ve written, too, on how we could learn a thing or two from the Thais about standardizing our food and making it appealing to tourists, but that’s another story. For cheap Thai eats, there’s Som’s in Makati which is superior to Som’s on Tomas Morato, but both have the unfortunate tendency to be uneven and keep erring on the side of putting too much sugar in their curries (perhaps this has been noticed by others, hence the debate on authenticity), though I tend to like their green curry. The prices are delightfully low, but the portions also tend to me at times, microscopic (this is particularly irritating when it comes to the catfish and green mango salad). 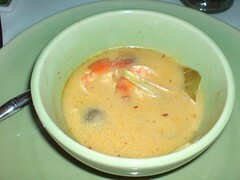 Tom Yum avoided the sin of being sugary, and the shrimp wasn’t tough. This was a superior Tom Yum. 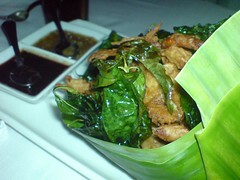 Soft shell crab, deep fried, with a tamarind and mango sauce, if I recall correctly. Absolutely and unqualifiedly delicious! That was a happy bunch of molting crabs, I can tell ya. This dish alone made the restaurant visit worth it. 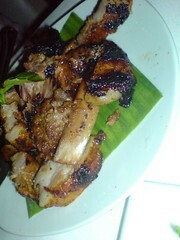 The cholesterol special was some sort of tamarind-infused pork rib thing. This is what inihaw, which normally leaves me cold, should aspire to. This pig must have been a happy camper, too. I generally dislike inihaw because it tends to leave the meat or fish or whatever tasting like it was incinerated on coals and I end up wondering if consuming so much charcoal will lead to colon cancer one day. But these ribs were, to start with, fatty, flavorful, tender, not too charcoal-infused, and with a delicate tamarind flavor that was quite charming. Alas, the green curry was… uninspired. This is a place with promise, I think it requires a second visit before a permanent verdict can be rendered. I’m not sold on the idea of Thai food being suitable for a date place (too many accidents waiting to happen) but it seemed to me the most romantic-looking restaurant in Serendra. look for the big mcdonalds, and across it is a complex of restos/spas and soms is on the 3rd floor!